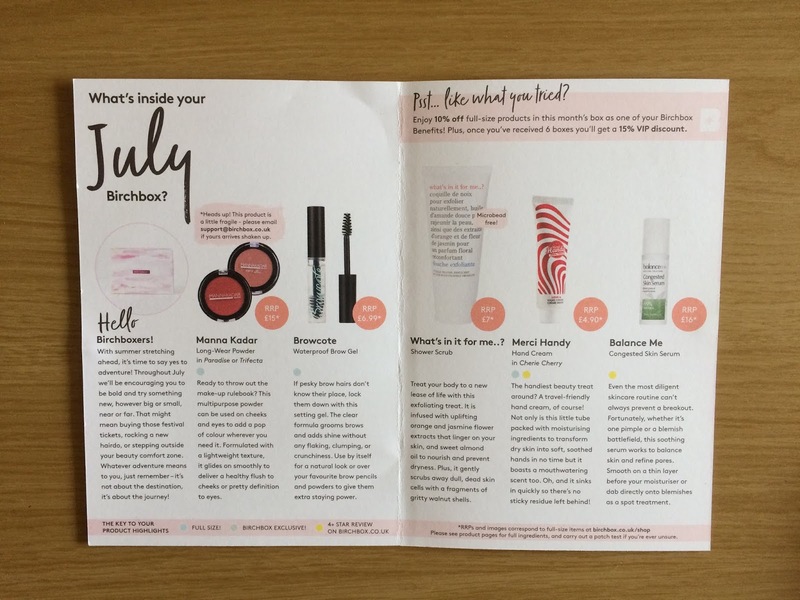 So to try and jazz up my blog I thought I show you what's in my monthly Birchbox. Birchbox is a monthly subscription box where you receive 5 beauty products, from cosmetics to shower stuff to perfume samples. I absolutely love my Birchbox and the start of each month when I know my box is on it's way to me. I have a beauty profile with things like my skins and hair type and how adventurous I want to be with my make up so my box is customised to me. 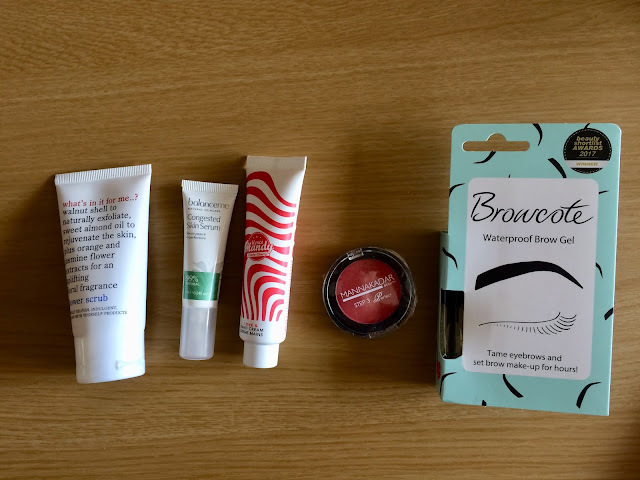 So this month I received a Browcote waterproof brow gel (which is a bit like mascara for your eyebrows), a 'Merci Handy cherie cherry' hand cream which I haven't used yet as I'm still using my Birchbox Cath Kidston hand cream from April, a 'What's in it for me?' shower scrub which smells amazing and I can;t wait to try out, a 'Balance Me' congested skin serum which is great and goes really well with the other Balance Me facial products that I've received in previous Birchbox's and a 'Manna Kadar' multi-use powder which can be used on the cheeks and eyes - this one i got to choose the shade so I went for the shade Blush; I haven't used this one yet as I'm trying to use up what make-up I already have on the go. Most months you get a chose on one of the products, like todays I received an email asking me what shade of eyeshadow I wanted in next month's box. You also guaranteed to receive at least one full-size product, but often the sample sizes are pretty decent. I've been getting my monthly Birchbox for quite a while now and you can cancel anytime and Ive built up a box of products so when I feel in the mood for a pamper I got out my box of Birchbox products. I've also come across products and brands which I love and have go on to buy them in the Birchbox shop. 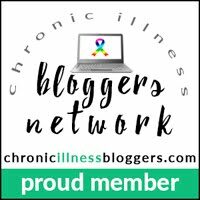 I'm still perfecting this type of post which i'll aim to do each month so if you want a better review or more information about what I go just leave a comment.